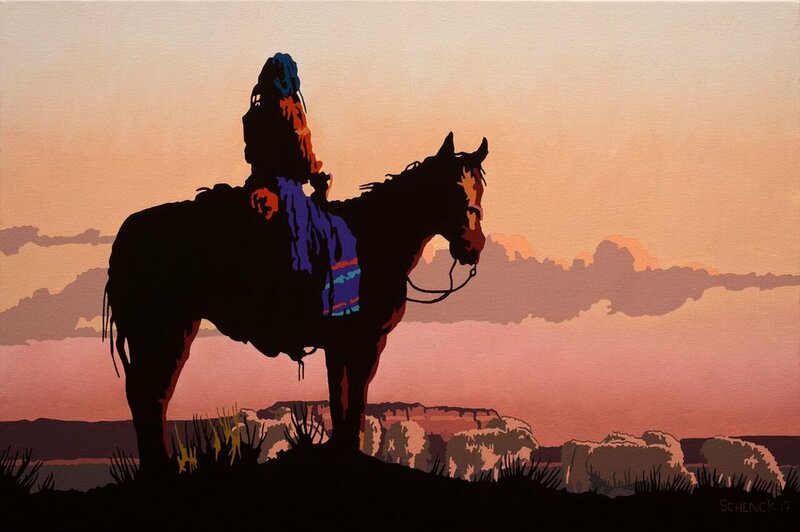 The Legendary West showcases three of Modern West Fine Art's longest practicing artists, including Billy Shenck, Ed Mell, and Gary Ernest Smith, each making their own distinct, interpretive mark on the established narrative of the West. During gallery stroll, we were privileged to hear from Schenck and Smith as they gave us more insight into their processes and practices. 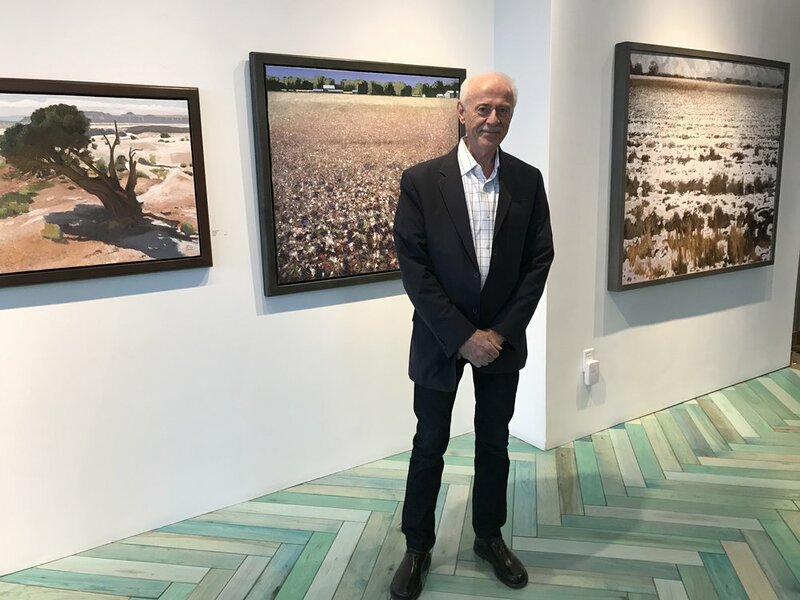 Pictured below, Billy Schenck stands in front of Taos Descanso [middle], which he revealed was one of his favorite pieces. "I first started my career in New York City without a lot of access to the West," Billy said. In thinking, then, about how to approach the iconography of the West, someone suggested to him, "Why don't you use movie stills?" It's from this romantic and cinematic point of entry that Billy Schenck first engaged formally with Western tropes in order to problematize them. "So, I started using black and white movie stills," Billy said, "and eventually gravitated to images of Southern Utah. Almost everything here tonight is from Monument Valley or the surrounding areas of Canyon Lands into Northern Arizona." "For quite a few of these, I use photographs to put together my skies and my landscapes. It's sort of a collage of images that I build." This technique of Schenck's is obvious in the photographic flattening of the scenes he paints. His signature, reductivist style also mimics the stylization of printmaking and Pop Art. "I like to set up situations," Billy continued, "It's sort of like being on a movie set with all your actors, waiting for your light to be right. But instead of using moving images with sound, I’m just shooting film to make stills." "This is a cowboy [above left] friend of mine who actually appears in a lot of Westerns and we rodeo together. We have a cattle-broker who got us these longhorns, and I photographed them." Schenck's captioned-pieces [above] were inspired by a series of black and white photographs [below] he made which are also captioned with excerpts of narrative fragments that he terms "revisionist history." These are made-up histories that Schenck reinserts into Western mythology to reinforce and highlight the fictive and invented nature of the Western, American myth. "I'm interested in exploring Western mythology, and diving into something that goes beyond the more traditional imagery. I wanted to make a war against this legacy," Schenck said. While Ed Mell was unable to join us for the opening reception, we were thrilled to showcase three new works that are emblematic of his iconic, signature-minimalist and angular-style. Mell was inspired as a child by automobiles and the futuristic designs of the late '40s and '50s and began his career in advertising and illustration. These influences are evident in his approach to the landscape of the West. 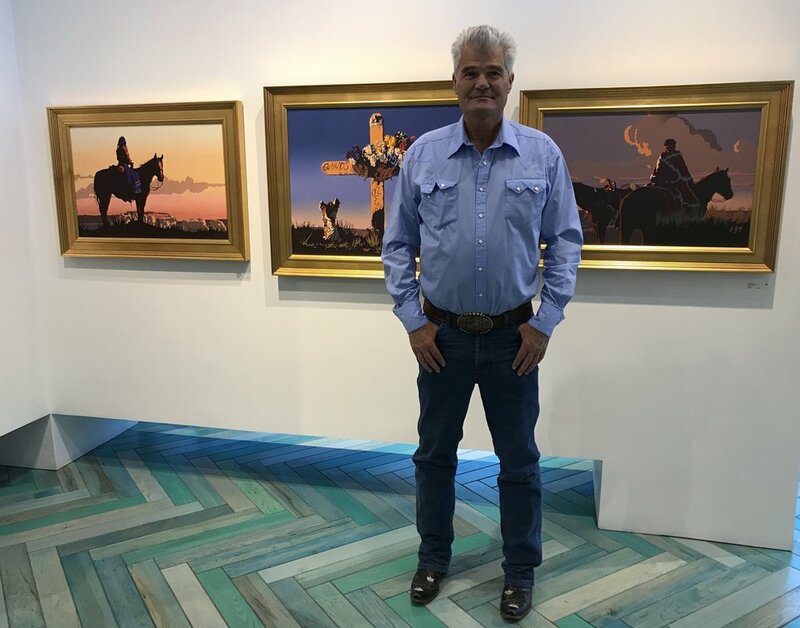 Pictured below, Gary Ernest Smith stands in front of a few of his works at the opening of The Legendary West. 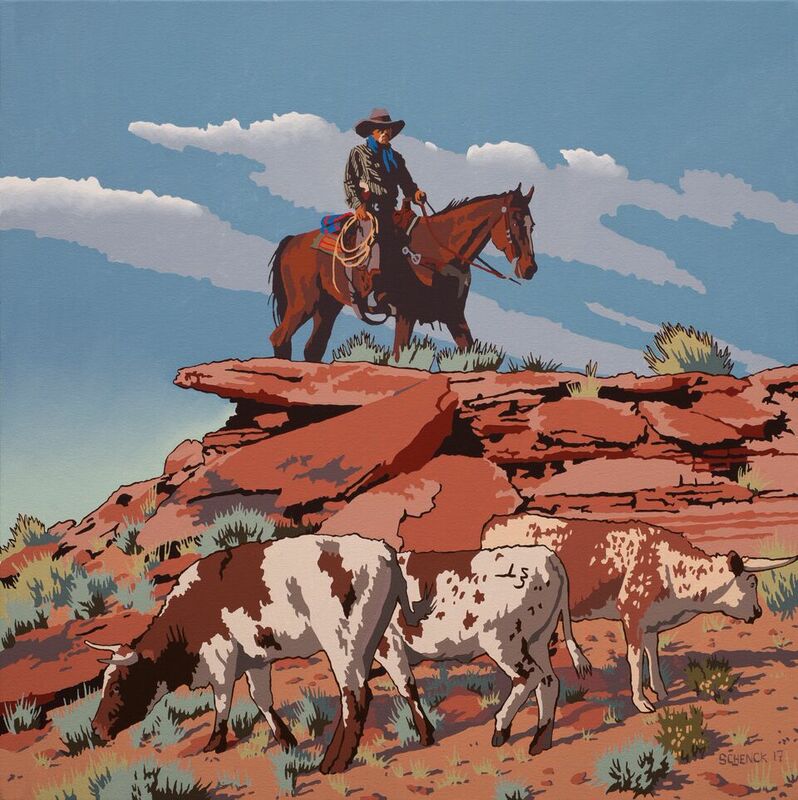 No doubt a product of living here and having deep connections to the West, all of Gary Ernest Smith's paintings in this show highlight Utah landscapes. "The field pieces are paintings that I have painted locally in fields that are in the process of becoming housing projects," Gary said. "Some are very near my home. This is happening so quickly that I said to myself, 'I’m going to do what I can to preserve a little bit of what this used to look like.'" It's this act of preservation and celebration of natural land that inspired these beautiful field and desert pieces. Of course, this preservation is metaphoric. Smith attempts to engage the viewer in completing the image, and essentially, its meaning. "I like to emphasize form and structure," he says, "and I delete details of things I consider unnecessary. I put in shapes where your eye [and your mind] can complete the rest of the form." 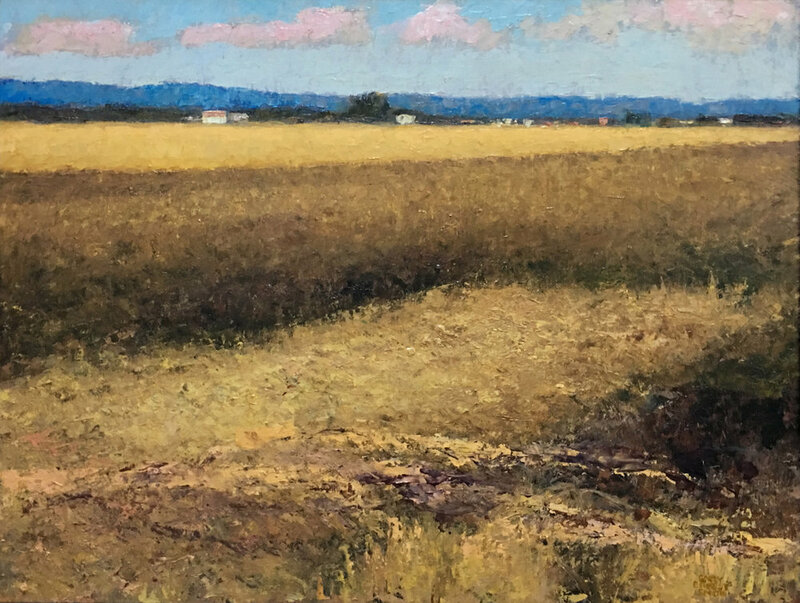 Using this technique of exaggerating basic, generic form, the end result is quite breathtaking, as Smith relies on color and shape to evoke the simplest memories and emotions. "This field, [pictured blow], is a soybean field." Speaking of his experience there, Smith recounted the vibrancy of the deep purples and reds. "When the soybeans ripen," he said, "they turn all shades of brilliant oranges." Smith talked about how enamored he was with the beautiful textures and colors in nature. It was on this vein that he revealed a bit of his practice that helps him remain true to natural textures. "My paintings are all done with palette knife," he said. It looks like a brush, but it’s not. Sometimes I shape my knives to give me the specific shape and texture I want." "I never exaggerated these colors." It's clear that Smith's works are all imbued with memories and contact, evidence of his relationship to the land he paints. 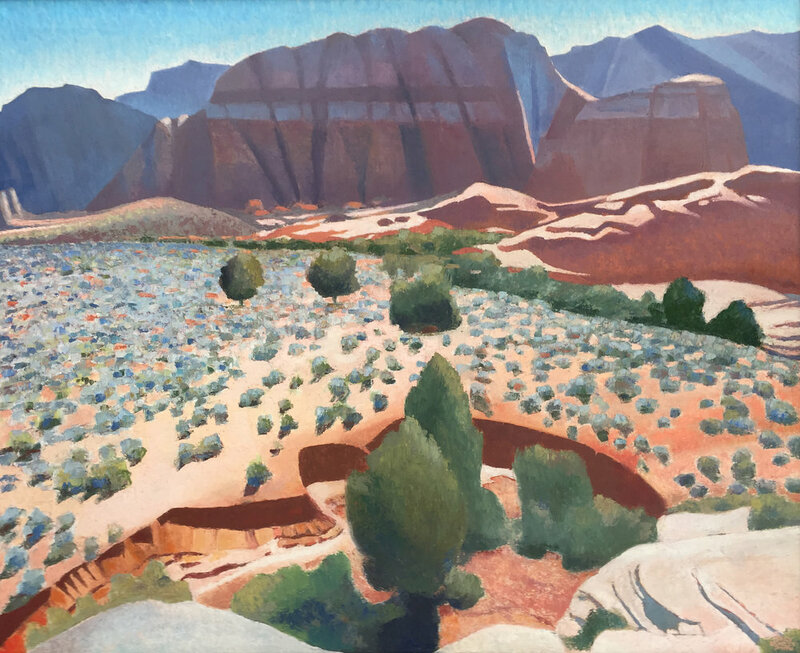 Speaking of his experience in Snow Canyon, [pictured above], Smith told of his encounter with a rattle snake as he was painting. Although an alarming moment, all that remains is a fond memory that this painting evokes for him. "I didn't bother him and he didn't bother me," he said. There is definitely an abstracted quality to his work. 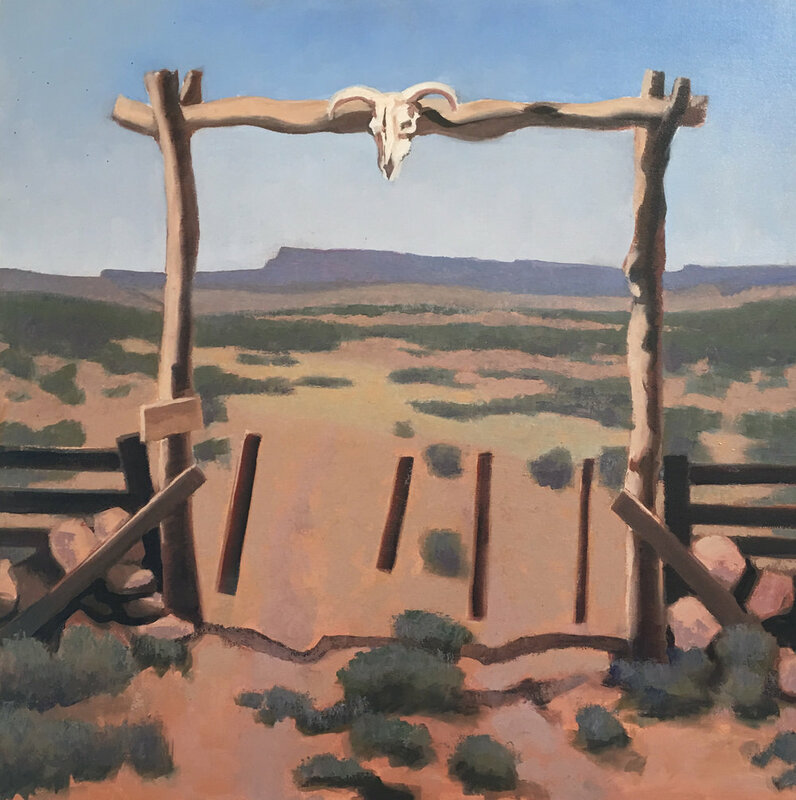 Speaking of his painting, Gateway [below], he said, "I saw this as one of the great symbols of the American West. You have this abstracted fence with different meanings depending on which side of the fence you're standing on. This became a symbol of interest to me." "One side looking back represented the old West of the past, and standing on the other side was a paved road going up to a gate, looking into the future. For me," he said, "this was a portal that captured time," and no doubt the sentimental feeling of capturing this changing, Western landscape.